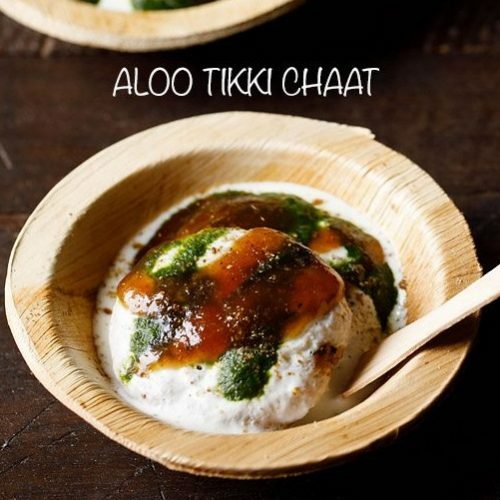 aloo tikki chaat is super delicious chatpata dish. in aloo tikki chaat fried potato patties are topped with a tangy sweet tamarind chutney and spicy green chutney along with curd (yogurt). rinse and then take 4 medium potatoes in a 2 litre pressure cooker. also add ½ teaspoon salt. add enough water just about covering the potatoes. pressure cook for 4 to 5 whistles on medium flame or till the potatoes are softened and of a mashable consistency. when the potatoes become warm, peel them and mash well. let the mashed potatoes cool completely. then add ¼ teaspoon turmeric powder, ½ teaspoon ginger powder, ½ teaspoon cumin powder, ½ teaspoon kashmiri red chilli powder, ½ teaspoon chaat masala and ½ teaspoon dry mango powder. then add ¼ cup chopped coriander leaves and salt as per taste. add 4 to 5 tablespoons rice flour. mix very well. check the taste and add more chaat masala or red chilli powder or dry mango powder or salt if required. make medium sized balls from the aloo tikki mixture. shape or flatten them in to tikkis or patties. heat 1.5 to 2 tablespoons oil on a tawa or frying pan. keep the flame to medium and then place the aloo tikkis on the tawa or pan. begin to fry the aloo tikkis. when one side is golden and crisp, flip each tikki and fry the second side. flip the tikkis again when the second side is golden and crisp. flip once or twice more and fry till all the alu tikkis are crisp and evenly golden. remove aloo tikki and place them on kitchen paper towels. for frying the next batch again add 1.5 to 2 tablespoons oil and fry in a similar way. in a bowl, take ½ cup of fresh curd and whisk till smooth. place 2 to 3 aloo tikkis in each serving plate or bowl. the aloo tikkis have to be hot when you start assembling them. pour some curd as required. then drizzle some green chutney. add as required. now drizzle some sweet tamarind chutney. add as required. sprinkle two to three pinches of chaat masala and 1 to 2 pinches of black salt all over. at this step you can add some sev, chopped onions and chopped coriander leaves. serve aloo tikki chaat immediately. recipe can be halved or doubled or tripled.